South Jakarta Fire and Rescue Sub-dept., held fire socialization at SD Al-Achfas Dwi Matra, Cilandak Timur.
" 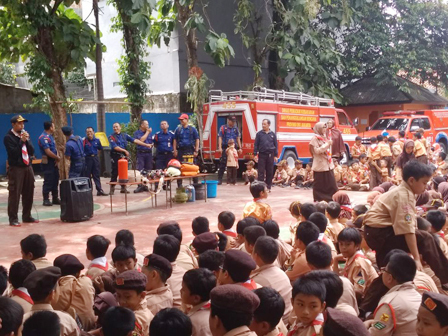 Hopefully, in future, students and teachers can know how to tackle the fire before the officers arrive to the location"
Moch Arief, Head of Pasar Minggu Sector IX said it was participated by 250 students and 25 teachers. In that occasion, they were given theory and practice of fire handling. "Hopefully, in future, students and teachers can know how to tackle the fire before the officers arrive to the location," he expressed, Thursday (3/22). He explained that participants were introduced fire-fighting equipment plus officers' duties and professions, including how to put out fires due to leakage of gas cylinders. "We also inform the goods that can be used for blackouts such as sacks, cloths and wet towels," he said.